The white and blue striped BORP bus pulled up to a Stanford gym and parked to unload. A loud diesel bus engine idle was drowned out by BORP’s youth basketball team chatter and hip hop music coming from their portable speaker. They unloaded out of the bus through the stairwell and off the wheelchair lift one by one each wearing their branded Jr. Road Warriors jerseys and huge smiles. Being able to travel together to their tournament on the bus creates a sense of camaraderie, leadership, and team mentality. The youth transfer their skills and confidence over to their performance in the gym, school, home and community. 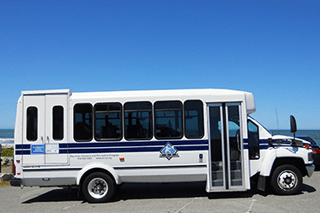 BORP’s accessible group trip transportation service is made possible by funding from Alameda County Transportation Commission through the Special Transportation Program for Seniors and People with Disabilities (Measure B funds). This service is aimed at improving the mobility of people with disabilities and increasing access to sports and recreation activities by supplementing conventional fixed route service and addressing the current gap in accessible group trip options for youth and adults with disabilities in Alameda County. More information about this project can be found at: here or at here. In addition to providing transportation for BORP program participants, we also offer a fee-for-service Group Trip Service option with discounted community rates for disability groups and nonprofits. Recently, we have served Lighthouse for the Blind, Independent Living Resource Centers, Children’s Skin Disease Foundation, Providence House, and YES Nature to Neighborhoods, to name a few. Our accessible buses allow your entire group to travel together in the same vehicle whether individuals are using a wheelchair or not. This promotes an atmosphere of inclusion and boosts group morale. If you, or someone you know is planning a group trip, let us know if you would like to inquire about an accessible bus for your outing. We appreciate the opportunity to serve our fellow community organizations.